Portable generators are perfect if you need a reliable back-up source of power. They provide this by using a small gas-powered engine to produce electricity. If you travel in your RV, go camping, or live off-grid, portable generators can be an excellent way of making sure you have access to power when you need it. I use my portable generator to top-up my solar system on cloudy days, or if I’m working late at night, and our power starts to run low. We reviewed dozens of portable generators to identify the best of the best. We considered features including the starting watts and running watts, which fuel each generator used, and whether they have an electric start. We also considered the weight of each generator, and how much noise they produce while running. 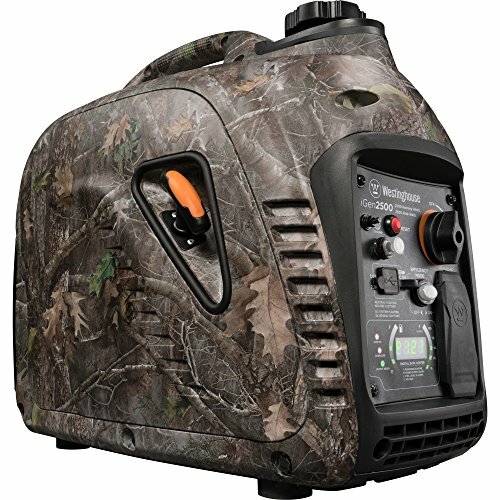 This powerful portable generator offers a remote push-button start and 12,000 running watts with up to 16 hours of run time. 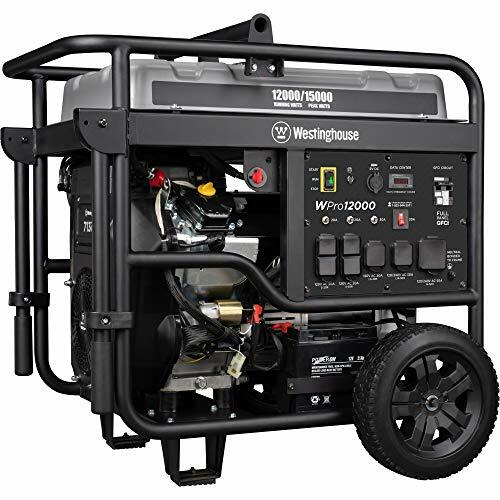 Our top pick is the Westinghouse WPro12000 Ultra Duty Industrial Portable Generator. This powerful portable generator stood out as a clear winner, thanks to a range of features, including an air cooled engine, innovative remote electric start, and all-terrain tires. The Westinghouse WPro12000 Ultra Duty Industrial Portable Generator stood out as a clear winner, thanks to its range of impressive and functional features. These include a remote start option, meaning you can start this generator from up to 109 yards away, using the included key fob. This is a great option if you’re running low on power in bad weather! The heavy-duty wheels and foam grip handle mean it’s easy to move this generator around, making it the perfect choice for RVing, as a backup at home, or for completing DIY projects. You also get loads of outlets and receptacles, including four 120V 20A 5-20R GFCI household outlets, one 120V 30A L5-30R receptacle, one 120/240V 30A L14-30R Transfer Switch Ready receptacle, one 120/240V 50A 14-50R receptacle, and two 5V USB ports – plenty of ways to connect multiple appliances. 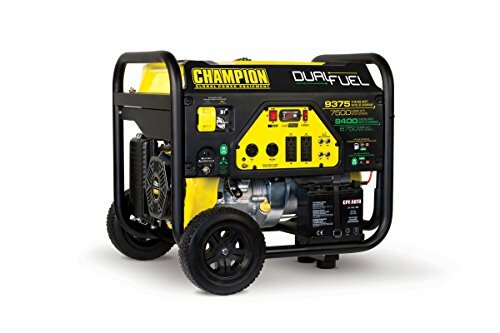 With an impressive 15,000 peak watts and 12,000 running watts, plus a large, 10.5-gallon fuel tank, this portable generator runs for up to 16 hours with less than 5% Total Harmonic Distortion. This dual fuel portable generator can be operated with gas, or propane, for ultimate convenience. Our runner up pick is the Champion 7500 Watt Dual Fuel Portable Generator with Electric Start. The dual fuel capability of this portable generator means it can be run on either gas or propane. When running on gas, you’ll have 9375 starting watts, and 7500 running watts. On propane, it offers 8400 starting watts, and 6750 running watts. There’s also a built-in surge protector to help prevent overloads. There’s no worry about starting this generator, as the electric start provides an easy option, but there is also a manual recoil start option. If you’re using this generator in winter, it includes Cold Start Technology to help make sure it starts every time. The power output monitor makes it easy for you to keep track of voltage, and run-time hours. With a decibel level just above a vacuum cleaner, this generator is perfect for both home and holidays. 8 hours run time on gasoline, 5.5 hours on propane. 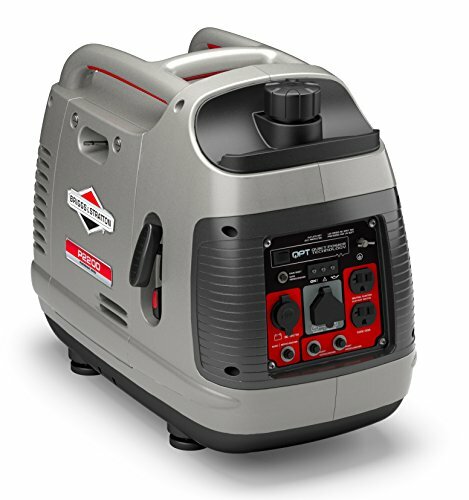 This portable generator is a great budget choice for camping and RV trips. If you’re looking for an affordable portable generator for occasional use, the WEN 561801800-Watt Portable Generator is a great choice. Its compact design provides reliable power, while the low-oil shutdown system protects the engine from damage. This generator is CARB and EPA compliant meaning it can be used in all 50 states of the USA. 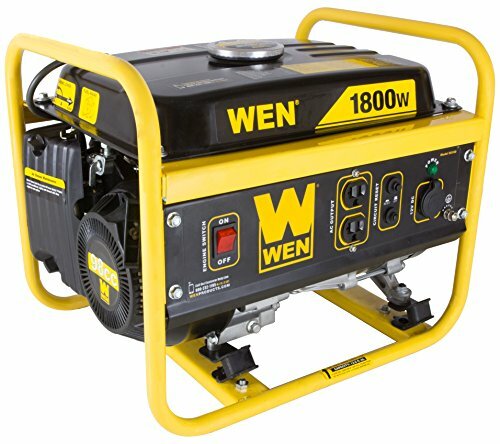 This WEN portable generator is also a great option when RVing or camping, as the spark arrestor means you can still use it when camping in forests or national parks. While it doesn’t come with wheels, it only weighs 50 pounds, so is light enough to move around without too much bother. You can purchase a wheel kit separately if you’d like that option. This portable generator uses inverter technology to make sure it runs extremely quietly. The Westinghouse iGen 2500 Super Quiet Portable Inverter generator provides an impressive amount of power, despite being both quiet, and lightweight. Once running, you’ll hear only 52 decibels of noise output, which for reference, is around the same as a refrigerator or air conditioning unit. It’s also very fuel efficient, and can run for up to 10 hours on just 1 gallon of fuel. It’s perfect for both an emergency backup during power outages, and for camping trips where you want to run a few appliances. This generator also has loads of great features, including an LED Data Center. This is a rotating digital display which shows fuel level, power output, remaining run time, and voltage output. This lightweight portable generator is also quiet, and fuel efficient. The lightweight Briggs & Stratton 30561 P2200 PowerSmart Series Portable Generator is a great choice if you’re looking for a versatile portable generator which is going to be easy to move around. The design is compact and easy to move around, thanks to the clever ‘H’ shaped handle, that allows 2 people to carry this generator. Coming in at only 55 pounds though, you can also carry this on your own. This is a fuel efficient choice as well, and can run for up to 8 hours at 25% load, using just 1 gallon of fuel. If required, you can also use the dedicated parallel connector port to connect 2 of these generators together. This creates more power for your devices, perfect in the case of a power outage. It’s worth noting that this generator cannot be shipped to California. Portable generators are an incredibly useful piece of kit. If you live off-grid, or even in an area where you sometimes suffer from power cuts, it’s reassuring to know you have a backup source of power. There’s nothing worse than a storm cutting your power, and knowing you have a freezer full of food which will quickly spoil. Or, you may live off-grid, and work online. A couple of cloudy days can soon impact your power reserves. With a portable generator, it’s quick and easy to recharge those batteries. Portable generators are also great for camping, and tailgating. You might also consider a portable power station, which we’ve reviewed in a separate post. Electric or pull-cord start. Most portable generators use a manual recoil start, where you pull a cord to fire up the engine. In most cases this is fine, but if you have shoulder problems, or limited strength, sometimes it can be difficult to use. Nowadays, quite a few generators offer an electric start option, which is as easy as pushing a button! Weight. If you want to move your portable generator around frequently, for instance from your RV, to your car, then into your boat, weight will be an important consideration. Lighter portable generators tend to come with a carry handle. Others have either 2 or 4 wheels which can be used to pull the generator into a new position. Starting and running watts. Before you decide on a portable generator, be sure to calculate the starting and running watts of all the appliances you plan on using. Many appliances require a higher number of watts to power up, then this decreases dramatically once they’re running. Selecting a generator which doesn’t have enough power to cover the starting watts means you won’t be able to power your appliances. Inverter or conventional. Portable generators are available in 2 types – inverter generators, and conventional generators. Inverter generators are small, lightweight, and quiet. They come in a casing which helps to reduce noise. Conventional generators are housed within an open metal frame. They are usually the cheaper option. They provide more power, but also create more noise. CARB and EPA compliant. CARB stands for the California Air Resources Board. This is an environmental agency which monitors emissions from generators. If a generator isn’t CARB compliant, it can’t be sold or used in states which follow these guidelines. The EPA (Environmental Protection Agency) puts in place national standards, which must be met by all manufacturers. What is a portable generator and how does it work? A portable generator provides you with electricity. They’re usually powered by gas, and use a small internal combustion engine to turn an alternator. It’s the alternator which generates the electricity. Once powered up, you can use the power outlets on the generator to plug in your electrical appliances. Portable generators are designed to be moved from place to place, for example if you’re RVing. They will often have wheels at one end so you can pull them along, or will be lightweight enough that you can carry them by hand. How many watts do you need in a generator? Starting watts. This is the maximum amount of power produced by your generator. Running watts. The amount of watts produced continuously, once your generator has been started. Generator manufacturer Honda suggests that most household appliances can be powered with a generator of between 3000 and 6500 watts. If you’re planning on using your portable generator when RVing, you may be able to use a generator with a lower wattage. When camping, a portable generator of 1000 – 2000 watts will most likely serve your needs just fine. This Wattage Estimation Guide will help you calculate the amount of watts used by a range of applications. If you plan on running multiple appliances, you’ll need to take that into account as well. Bear in mind that many applications, including air-conditioners, hair-dryers, and microwaves all have a far higher starting wattage than their running wattage. Make sure you select a portable generator which has a wattage higher than the starting wattage of any appliance you want to use. What can you run on a 2,000 watt generator? With a 2,000 watt generator, you could run a refrigerator, TV, lights, and laptop. That might be perfect if you’re in an RV for a vacation. If you’re at home, and want to run a water pump at the same time as those appliances, the starting wattage of the refrigerator and the water pump would be over 2,000 watts, so your generator would cut out if you tried to start both of these at the same time. How many appliances can a 5,500 watt generator run? A generator of this size should be sufficient to run most household items, but you’ll need to be careful about the order in which you power up your appliances. As an example, if you want to run your Refrigerator/Freezer, kettle, and air con unit at the same time, this is achievable with a 5,500 watt generator. But, starting them all at the same time will put you over the 5,000 watt limit. Start appliances with a higher starting wattage first, and wait until their power usage decreases to their running wattage. Then gradually add your other appliances one by one, so you don’t overload the generator. We looked at 20 other portable generators. Even though they didn’t make our 5 best portable generators, they’re still be best of the rest and each is a great option for your dog. The information you’ll need to compare each one is included with the listing. This quiet, 2000 watt inverter generator is parallel ready so can be connected to another of the same model to increase your power. This powerful generator provides 6500 starting watts, and 5000 running watts. This quiet inverter generator provides 3100 starting watts, and 2800 running watts. This advanced open frame inverter generator is 50% quieter, and 20% lighter than a comparable traditional generator. This portable generator provides 2000 starting watts, and 1600 running watts. This compact generator is suitable for use in all 50 states. This Honda generator provides reliable power in a lightweight package. This lightweight and quiet inverter generator has a compact suitcase design for easy transportation. This compact generator provides up to 13 hours of run time. This lightweight generator is ideal for camping, or emergency use at home. This dual fuel portable generator can be powered using either gas, or LPG. This generator is perfect for trips away, or use at home. This dual fuel generator has an electric start, for quick and easy power. This EPA certified generator provides 10000 starting watts, and 8ooo running watts. With dual fuel capability, this generator provides 10000 starting watts, and 8000 running watts on gas. On LPG, it provides 9000 starting watts, and 7000 running watts. This portable generator provides 4000 starting watts, and 3300 running watts. This dual fuel portable generator provides 4850 starting watts, and 3850 running watts. This portable generator has 3 outlets, and a run time of 8 hours. This 4000 watt generator can run for up to 8 hours with a 50% load, using just 4 gallons of fuel. If you’re looking for a portable generator with an RV outlet, this is the perfect choice for you. Emma is a freelance writer, specializing in writing about pets, outdoor pursuits, and family living. She is also a qualified Science teacher. Emma is from the UK, and has lived in Costa Rica and New Zealand before moving to a smallholding in Spain with her husband, their two-year-old daughter, and 14 animals. This includes dogs, cats, horses, and poultry. She enjoys trail riding in the mountains near their home, riding her horse Trifle (who was a wedding present!) and taking along her two dogs Ronnie and Blue, who love adventures. Her other dogs, Rosie and Max, can usually be found having a snooze at home.